No pre-browning, and only 1-2 minutes to get this lick your plate clean, 5 ingredient dinner going in the morning! It makes a delicious and rich, thick gravy with the pot roast! Don't let the surprise ingredient of Ginger ale throw you off! I happen to use diet since my husband is diabetic. This recipe came from a local church cookbook, and I knew I had to try it as soon as a saw it. Jan's Tip: double the "Gravy" ingredients, (all the ingredients other than the roast) Years ago I started doing this and find it is the perfect amount of gravy for my family. In separate mixing bowl, combine soup mix, gravy mix, remaing flour and ginger ale. Mix well. Pour over roast. 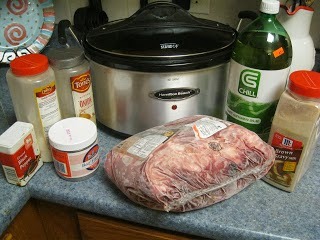 Cover and cook on low for 8 to 10 hours in a slow cooker. Serve with mashed potoates or noodles.